Jennie Finch trading cards and autograph memorabilia are considered highly collectible despite her retirement from softball some years ago. Her popularity can be traced back to her stellar NCAA career as a pitcher for Arizona State and her numerous tournament appearances in international competition. As one of the founding players of the National Pro Fastpitch league, her on-field success and commercial appeal made her the First Lady of Women's Professional Softball and the face of the sport for several years. Jennie Finch's first appearance on a trading card came courtesy of Upper Deck in 2002. 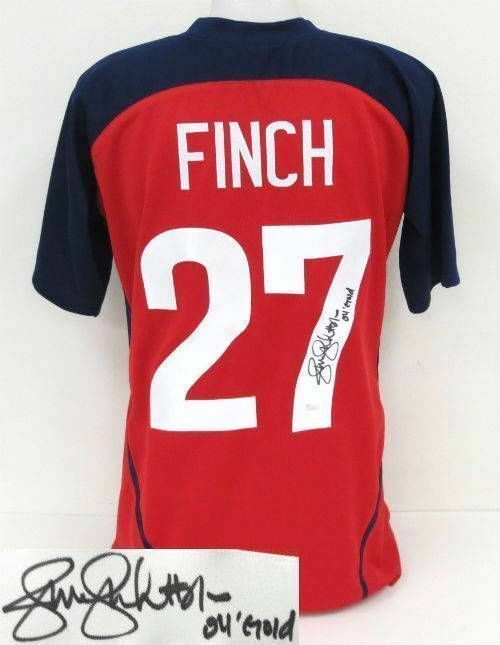 That year, the company partnered with the Amateur Softball Association and produced a limited-edition 23-card USA Softball set of which Finch was included. Since that time she has been on the checklist of many mainstream sets which included autograph and memorabilia cards. 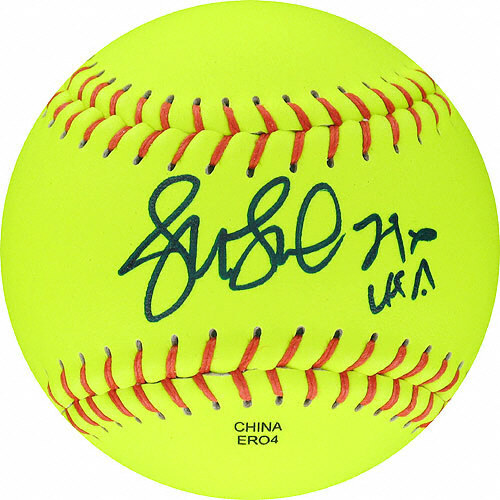 As would be expected, Jennie Finch autographed memorabilia is very popular with regulation softballs and signed jerseys being among her most popular items. Her appearance in the 2005 Sports Illustrated Swimsuit Issue made the publication an instant collectible as did her cover appearance on a regular issue of the magazine that same year. Autographed copies of both issues can command decent money. 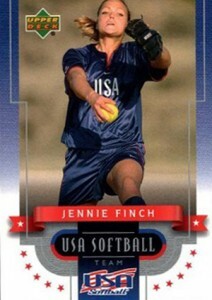 Jennie Finch's very first trading card is also her most difficult to find. Produced in limited quantities as part of a 23-card set, when they do become available, they often sell for more than you might expect. Graded and autographed versions that have been authenticated by a company like PSA/DNA or JSA are also very popular. Inserted as part of the popular cross-sport, cross-brand Fans of the Game insert, this is one of Jennie Finch's first autograph cards. The signature is on a sticker and the card is not serial numbered. 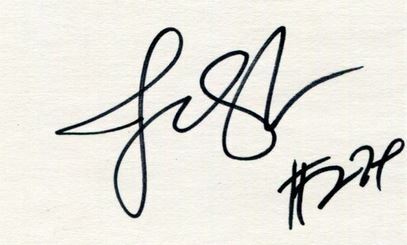 The second Jennie Finch autograph released in 2004, his card features a heavy foil design and sticker autograph. A Gold Parallel version of the card also exists and is serial numbered to 25 copies. This card feature's Finch's signature on a piece of fabric. It's not game-used or even worn by Finch but it makes for a distinct look. It comes numbered to 249. 2014 Leaf Q Sports Heroes "Pure Autographs" JENNIE FINCH #'D 24 25! Rare! 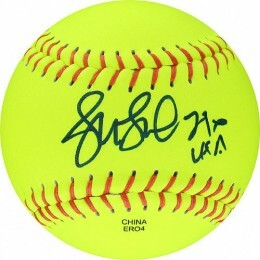 Below you will find examples of what an authentic Jennie Finch signature autograph looks like. This can be used as a first point of reference for determining the legitimacy of autograph memorabilia, but is not a substitute for having your items authenticated by a well-respected professional autograph authentication company. Some of the trusted sources within the sports memorabilia market include the following companies: PSA, JSA, Tristar and Mounted Memories. Click on any of the images below to view full size photos. 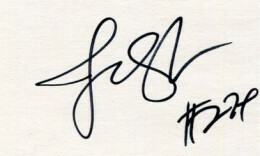 Defined by a flowing signature that is hard to discern individual letters. The letter "J" has paisley shaped loops on top and bottom and are connected by a triangle shape on the left. The pen stays on the item in an angled up and down strike. The next character looks like a figure "8" on a left leaning angle. This flows into a large triangle shape and trails to the right. She almost always signs her jersey number "27" and an ithacus fish shape.